Internationally renowned citrus liqueur Mandarine Napoléon hosted a private, spirited bash for its official U.S. launch at our favorite place on the planet, Soho Beach House on Tuesday, September 20. The first spirit to combine mandarins and aged cognac, Mandarine Napoleon was created especially for Napoléon Bonaparte, and was his drink of choice, which is the reason for the party’s theme: “The Hat is Back” in honor of the petit French ruler’s iconic, black bicorne chapeau. This also explains the themed event’s costume de rigueur. You guessed it- a hat! The stylish guests complied, donning a wide variety of head attire- from feather headdresses, to Viking hats, to fedoras to co-host, Susanne Birbragher’s mink headpiece, a throwback to the “Grand Puba” hat worn by Fred Flintstone, whom she calls “Pica Piedra (love that! ).” During the elegant dinner for 50 of Miami’s social elite, which was served amid twinkling trees on a perfect fall evening at Cecconi’s, we felt as though we were in a fairy-tale version of Iron Chef’s kitchen stadium, as each of the four courses served featured Mandarine Napoléon as a key ingredient, which was incorporated in a unique manner throughout the dishes and accompanying specialty cocktails. Our favorite courses included the exquisite risotto with grilled shrimp and the succulent duck. Of the seven signature cocktails, our top pick was the creamy Coco Napoleon, which was more like a delicious dessert, made with coconut milk, Martinique spiced sugar cane syrup, fresh squeezed lemon juice, mint leaves, a dash of orange bitters, and Mandarine Napoleon- of course. 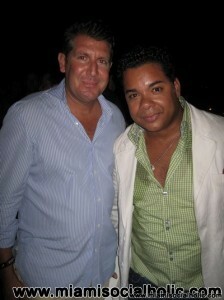 Hats off to Soho Beach House’s executive chef, Sergio Sigala and head bartender, Chris Hudnall! After dinner, more than 250 guests joined the dinner group around the pool and the Tiki Bar for the official after party. To add to the already whimsical evening, a beautiful contortionist performed inside an enormous, clear, inflatable sphere inside the pool (think hamster ball). Guests also enjoyed the interactive photo booth, for which they could choose an outlandish hat from a “hat shop” and pose in front of Napoleon himself. 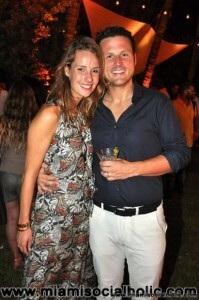 Notable guests included: Marc de Kuyper, owner of Mandarine Napoléon, and wife, Viviane de Kuyper; Matthijs Jansen, Mandarine Napoléon’s Master Distiller; Suzy Buckley, Editor in chief of Ocean Drive magazine; John Lin; Bonnie Clearwater, MOCA Director; Silvia Karman Cubiña, Bass Museum Director; Anne Owen, publisher of Miami magazine; designer, Sam Robin; photographer, Iran Issa-Khan; Barbara Becker; Setai owners, Jonathan and Criselda Breene; Ken Lyon;Todd Erickson, Executive Chef of Haven; Susie & Walid Wahab; Lauren & Angelo Vieira, of Morgans Hotel Group; Daniel Singer; news anchors, Belkys Nerey and Shannon Hori; and international jetsetters, Carston Cramer, and Anke Van Echten, who flew in from Amsterdam for the occasion. Upon departure each attendee walked away with a brand new fedora. 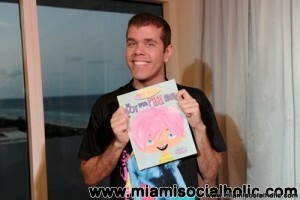 On September 16, Eden Roc Renaissance Miami Beach hosted an exclusive book signing cocktail party for celebrity blogger Perez Hilton, a Miami native, to launch his newly released children’s book, The Boy with Pink Hair. Guests including Emilio Estefan, Frank Amadeo, Ingrid Casares, Roy and Lea Black, David Naranjo, Adriana de Moura, Marysol Patton, Louis Aguirre, Michael Gongora, Mario Vergel, Jason Clarke, Jose Ortiz and many other friends and fans of Hilton, mingled, and toasted with and sipped Martini Moscato d’Asti and Grey Goose cocktails and enjoyed light bites provided by Eden Roc Renaissance Miami Beach. Guests at the party had the opportunity to purchase The Boy with Pink Hair which tells the story of a child born with a shock of fabulous hair that sets him apart from his peers. While some find this difference hard to accept or understand, The Boy with Pink Hair uses the opportunity to find what makes him special and share it with the world. The children’s book is illustrated with vibrant retro-feeling art by first-time illustrator Jen Hill, putting into pictures the fun that comes with embracing individuality. photo credit: World Red Eye.